On Monday night, Hillary Clinton and Donald Trump met onstage at Hofstra University to debate the important issues of this election: ISIS, Trump’s tax returns and Clinton’s emails, and whether or not Rosie O’Donnell deserved to be called a fat pig. It was a sniffling mess of a night, and there are still two debates to go. An initial observation of evening revealed a health-related fact neither candidate could deny: Donald Trump’s nasal passages were inflamed by... something. Howard Dean suggests it might have been cocaine, which would explain Trump’s twitchy, fidgety demeanor and constant water drinking—ironic, considering his mockery of now-fellow sipper Marco Rubio—but there are other explanations too. The first real conflict of the evening came up as the candidates discussed two things they didn’t want to discuss; Trump’s initial $14 million investment from his father, his still-unreleased tax returns and Hillary Clinton’s still-deleted emails. Both candidates stuck to their usual responses, but moderator Lester Holt pressed Trump on his returns, saying there was no rule preventing him from releasing his them just because they’re under audit. Trump seemed to agree, saying he would also release them if Clinton released her deleted emails. “So it’s negotiable?” Holt asked. Trump also seemed to admit he hasn’t been paying federal income taxes, telling Clinton that not paying them on the few tax returns of his that have been made public, “makes me smart.” When she accused him again of not paying them at all, he argued they would only be “squandered” by politicians like Clinton if he had. 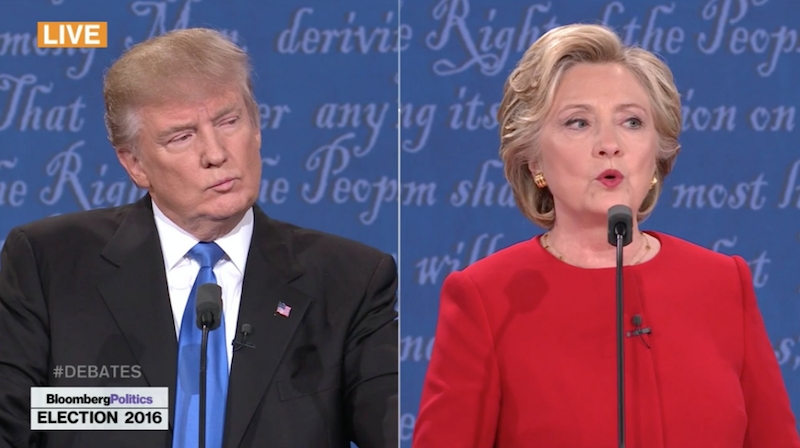 While Trump ignored the rules of the debate to repeatedly cut in on Clinton, Clinton seemed unwilling to react to him and stuck to her talking points, a criticism she acknowledged with a similarly canned line. “I think Donald just criticized me for preparing for this debate. And yes, I did. And you know what else I prepared for? I prepared to be president. And I think that’s a good thing,” she said to the sound of audience applause, which was a violation of debate rules that still occurred in support of both candidates throughout the night. Asked about his early support of the Iraq war, Trump gave this loony tunes answer, which started out as a fact check and ended with him talking over Holt while bragging that his strongest asset is his temperament.